Fascinated by the idea of asset-produced monthly income, Peter founded Cashflow Heaven Publishing in 1999 to help his subscribers obtain a better lifestyle through trading and investing strategies designed to produce exceptional monthly returns. freeze shut in the biting wind. 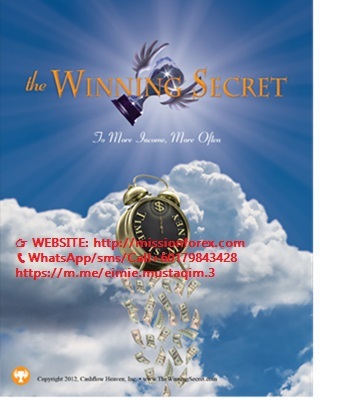 What is The Winning Secret? The Winning Secret is a conservative, but highly effective options strategy that only a small number of traders realize exists—and of those that do even fewer actually trade it. The reason is simple and has to do with basic human nature–most people would rather buy a lottery ticket than sell the tickets. And yet it’s the ticket sellers that seem to make all the money (just ask any State government that sponsors a lottery). If you like the idea of trading the safer side of options to generate some surprisingly generous monthly cashflow–then this is your strategy. This strategy has been averaging 5% or more every two weeks with a risk profile that is safer than the conventional “buy and hold” stock investing that brokers have traditionally recommended for their most conservative clients. This level of return is 2 times greater than the average yield of the SP-500 for a YEAR—yet this strategy typically brings in that rate of return approximately EVERY TWO WEEKS! That means The Winning Secret is 52 times more profitable than typical dividend investing–and a simple options probability calculator tells us it’s 9 times safer than conventional options buying strategies. If those numbers hold true it means you could conceivably compress fifty-two years of average income investing into just one–that’s a lifetime of successful investing returns compressed into just one year! If you’ve been trying to play ‘catch-up’ with your retirment plan this strategy could be the answer to your prayers. The key to comfortable retirement? With this strategy you could be a lot closer to a comfortable retirement than you think. Yes—I want lifetime access to the Package Buyers section of the Winning Secret site, including the 152 page digital manual, 10 videos, 14 downloadable audio files & past webinars to give me everything I need to trade this strategy with confidence. The Winning Secret to More Income, More Often–takes the fear out of trading options and replaces it with knowledge, confidence and a strong mathematical likelihood of winning–frequently and generously. Focusing on options selling strategies such as credit spreads and iron condors, this educational package includes lifetime access to the Package Buyers’ section of the Winning Secret site, including a big 152 page digital manual complete with color charts, graphs, illustrations and examples to help ensure you start off profitably and stay that way. In addition to your eBook you’ll also receive a graphically detailed 15 video library with accompanying text from a series of live webinars presented to show you every money-making detail of this strategy. The beauty of these videos is you can watch them as often as you want to really assimilate the information–and because they exist inside a special section of this website you can watch them from anywhere you can get an Internet connection. And if you would rather listen in your car or at the gym, you’ll also gain access to a completely different set of 14 audio files you can quickly download to your MP3 player or iPod so you can take your options education with you wherever you go. This set is tailor made for listening–no pictures or charts are referred to like in the video files. The information is clear, easy to understand and at a pace you can easily follow. PLUS the 10 Module set teaching you how to trade weeklies for some big profits and all future updates and webinars added to the site are included for FREE with your purchase. What would it be like for you to be trading consistently, day in and day out, week in and week out? Where would your confidence be if you knew you were on top of your trading game? How would you feel if you knew you were doing the right things in your trading – minimizing unforced errors, sticking to your plan, practicing sound money management, maintaining composure and poise in your trading, and exercising positive and reliable trading actions? Well, all of this is very possible.